Gesine Lötzsch (German pronunciation: [geˈzinə løːtʃ]; born August 7, 1961) is a German politician of the left-wing party Die Linke ("The Left"). In 2010, with Klaus Ernst, she was elected president of the party. Born at Berlin-Lichtenberg in what then was East Germany, Lötzsch joined the Socialist Unity Party of Germany in 1984 and continued a member of its successor parties: the SED-PDS (1989–1990), the PDS, (1990–2005), Die Linkspartei.PDS (2005–2007), and from 2007, Die Linke. In 2002, as a candidate of the Party of Democratic Socialism, Lötzsch was elected to the German parliament (the Bundestag) for the constituency Berlin Lichtenberg, which she continues to represent today. For her first term, she and Petra Pau were the only PDS deputies in the chamber. Lötzsch has been criticized for suggesting that former employees of the Stasi, the secret police of the former East German state, should be allowed to serve in parliaments and governments. 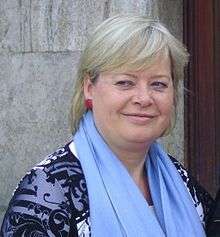 The leader of the Alliance '90/The Greens, Claudia Roth, claimed that Gesine Lötzsch wants to "sweep the past under the carpet". Lötzsch's local party group in Berlin-Lichtenberg has invited former Stasi employees and informers to speak on several occasions with her support: for instance, Erich Mielke's immediate deputy, Werner Grossmann, was invited as a speaker. Green member of parliament Wolfgang Wieland criticized her for appearing as a speaker before a revisionist association, the Initiativgemeinschaft zum Schutz der sozialen Rechte. Gesine Lötzsch is married to Ronald Lötzsch, who in 2010 was revealed to have been an informer for the Stasi. ↑ "Lötzsch: Stasi-Spitzel können auch Minister werden" [Lötzsch: Stasi informers can be also Ministers]. Potsdamer Neueste Nachrichten (in German). 2010-02-08. Retrieved 2016-08-22. ↑ "Kritik an Lötzsch wegen IM-Fürsprache". Focus Online (in German). 2010-02-07. Retrieved 2016-08-22. ↑ Neuerer, Dietmar (2010-01-27). "Gesine Lötzsch: Lafontaine-Nachfolgerin pflegt Kontakte ins Stasi-Milieu". www.handelsblatt.com (in German). Retrieved 2016-08-22. ↑ Banse, Dirk; Müller, Uwe (2010-03-15). "Gesine Lötzsch hat ein Stasi-Problem" [Gesine Lötzsch has a Stasi Problem]. www.morgenpost.de (in German). Retrieved 2016-08-22. ↑ "Stasi: Ehemann von Gesine Lötzsch steht unter IM-Verdacht" [Stasi: Husband of Gesine Lötzsch is suspected of being an 'unofficial collaborator']. Spiegel Online (in German). Der Spiegel. 2010-03-16. Retrieved 2016-08-22. Wikimedia Commons has media related to Gesine Lötzsch.